Mobile Broadband Internet in your area. 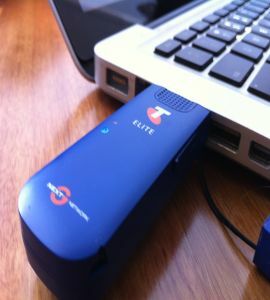 Mobile broadband is a connection that allows you to use the internet while you are on-the-go. There are two variations of how you can use mobile brandband service. The first one is through your cellphone. The mobile provider will offer you data plans where you will pay per amount of downloads, rather than per minute like a telephone line would be. For example, a carrier can offer you 1GB, 5GB, 10GB of data. The other method is to purchase what is commonly called a "dongle". This is a miniature modem that plugs into a USB socket. This is the best option if you would like to easily use your laptop everywhere at anytime without needing to connect to wireless internet. Anywhere you will be able to get a good signal (usually 3.5G or 4G), you will be able to travel with high-speed broadband. Mobile broadband offers competitive prices that will usually end up being cheaper than the home-based broadband plans. The portable dongles are basically mini modems that allow you to access internet anywhere you are, which is super practical. The 4G speeds are comparable to home broadband and it is becoming a widely use alternative to fixed-line broadband. Mobile broadband depends on the phone connection, so anywhere you are bound to have a bad connection you will not be able to use the service. The download speeds and caps are set by certain providers. Thus, mobile broadband will not be the best option for people that are heavy users. The speeds vary based on the provider. Depending on who you choose for your ISP, there might be a better home-based broadband option for you.